Webcast utilizing Skype Group call. Video feed on the left / Skype call on the right. Lately there has been a lot of interest to incorporate Skype interviews during live webcasts. 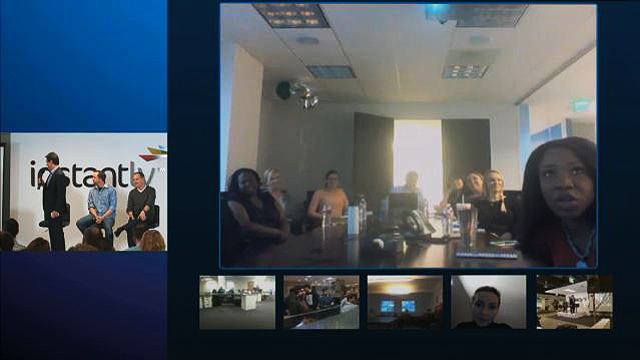 In this situation, Instantly Inc. wanted to have all of their field offices from around the world participate in the opening segment of their global meeting. This was accomplished using our Skype integration system while taking advantage of Skype’s new and improved group calling feature. The local audience could view all of the remote participants on a projection screen and their audio was piped into the house sound system. The webcast audience saw a dual feed of the headquarters on the left and the Skype callers on the right. The Skype participants were able to see and hear the corporate officers who were on camera in front of the live local audience. Admittedly this is somewhat tricky to pull together. We had a rehearsal/test call a few days before to make sure all of the participants had their Skype systems set up properly. The day of the webcast, we had everyone connect an hour early and remain on standby until they went live. We had their video and audio muted while on standby except that there is a push-to-talk microphone to allow private communication with them. Skype has an IM chat feature which is useful during this standby period, especially when someone is experiencing internet bandwidth restrictions. In the end the effort of linking the whole company together live really paid off. The remote participants had a much stronger sense of “being there” and the home office had a chance to feel like they were one united team.